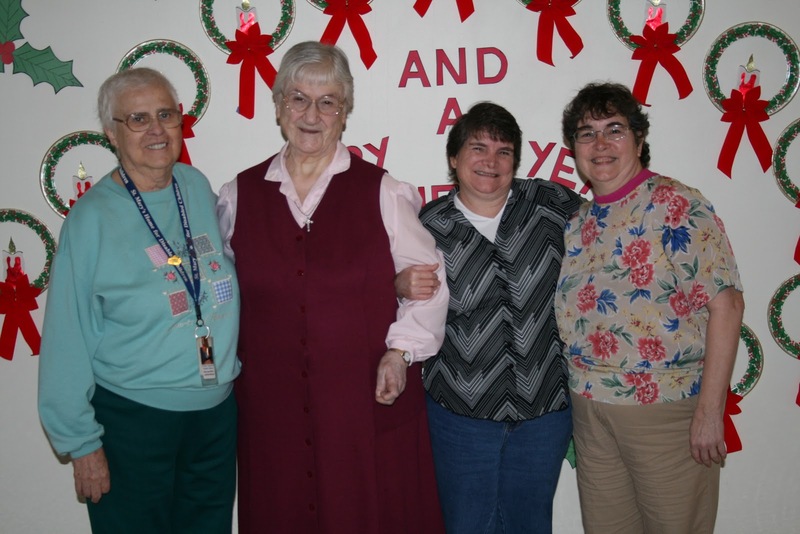 Two Sisters, and two sisters: From left, Sister Mary June Morin of St. Mary’s Home, Sister Francis Clements, and Clements’ nieces, sisters Michelle Masters and Mona Lankford, during the family’s recent visit to St. Mary’s. Sisters Michelle Masters and Mona Lankford visited St. Mary’s Home last week to donate Christmas presents to the children and young adults, including sleepers and school supplies. This was the 14th year the family brought presents to the Home for the holidays, following a tradition started by their mother, Mary Catherine Masters of Portsmouth, who used to rock babies at the former St. Mary’s Infant Home. The daughters had never ventured beyond the front lobby of St. Mary’s current building, which opened almost six years ago. So during their recent visit, they took a tour of the 88,000-square-foot facility and saw children attending class and having fun during physical therapy sessions with St. Mary’s staff. With them was their aunt, Sister Francis Clements, a member of the Sisters of St. Francis, based in Oldenburg, Ind. Sister Francis and her nieces also got to meet Sister Mary June Morin, a Daughter of Wisdom who has worked at St. Mary’s Home for more than 50 years and is the last nun remaining on the staff. Sadly, Mary Masters, who was 81, passed away on Sunday. In yet another act of generosity, the family requested that in lieu of flowers, memorial donations may be made to Oasis Social Ministry or St. Mary’s Home for Disabled Children. Her legacy of kindness and thoughtfulness lives on through her family.